Material: steel wire Color:green Quantity:1pcs Length: Approx. 3 M(118") Handle Length: Approx.14cm(5.51") High Speed Skip Rope, lightweight. Adjustable length steel wire core cable covered with PVC. Increase speed, reliability and performance. Allows for durability and maximum rotations per second. Use only on smooth non abrasive floor surfaces. Twist and kink resistant wire increases reliability, speed and endurance. Skipping is one of the best cardio vascular exercises that produces results, is cheap and can be done anywhere, anytime Ideal for shedding weight fast, toning up and maintaining muscle tone. 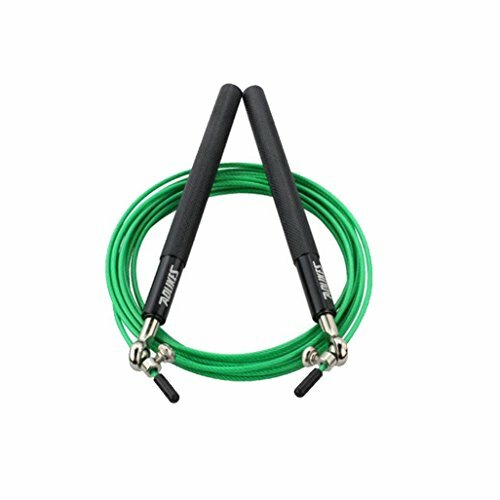 Skipping ropes are an excellent tool for any fitness level or goal.